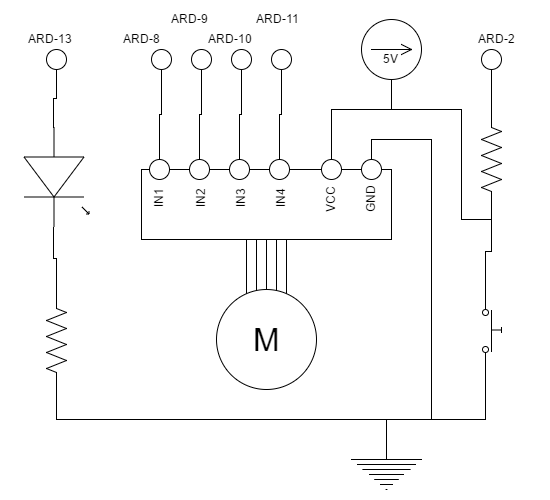 The Arduino circuit is controlled by a single push-button switch, which turns on and off the motor when pressed. The LED shows the status of the system: on startup, it blinks three times to indicate that the system is ready, and it lights up when the motor is running. The Arduino sketch watches the input for button presses, lights the LED, and controls the stepper motor through the driver board. 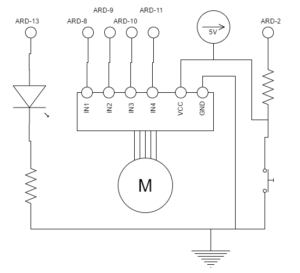 You can download my sketch if you want to build your own circuit. Check the YouTube video for assembly instructions of the turntable. Once you have the turntable assembled and working, you are ready to scan in your object. Put your camera on a tripod and point it at the object. Try to fill the frame as much as possible with your object. You should also try to have a background that does not have any features, or add your own plain background using paper or cloth. Start the turntable and then take pictures every 5 degrees or so. Once you have a full rotation of pictures, set your camera at a different height and repeat the process. Upload both sets of photos to Autodesk Remake and wait for the Autodesk Cloud to turn your images into a 3D object! For a better original design, check this Instructable by shapespeare. He added an infrared LED to send the remote shutter signal to his camera, so the Arduino automatically turns the objects, pauses, takes the picture, and repeats until all of the photos are done. Posted in 3D Printing, Software, YouTube.